This past November we hosted our first American Thanksgiving. Before that we had been lucky to be invited to various friend’s Thanksgiving dinners, and before that we were in Canada. Our dinner was a very chill affair with a few friends—not a stressful and pressure-filled multi-day cooking feat. It’s hard for me to get SUPER excited about traditional thanksgiving fare so I chose to liven our meal up with a Mexican fusion approach to the usual veggie sides and roast. Since we were a small group I roasted us a chicken instead of a turkey and glazed it with a simple chipotle and honey sauce. It turned out moist and delicious. My other favorite was the brussels sprouts tossed with a chile and peanut sauce. Anyway, why am I telling you all this? Well, I’ve been wanting to share that meal with you guys, but a simpler everyday version. 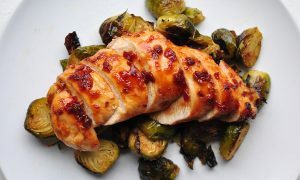 So here’s a weekday meal inspired by our Thanksgiving using the ubiquitous boneless, skinless chicken breasts, a pile of brussels and a simple to whip together, chipotle-honey sauce. This meal is roasted on one sheet pan and everything is cooked together. All you have to do is cut off the ends of the brussels, cut them in half, mix up the sauce and coat everything. Then you just wait for the oven. An entire chicken breast and pile of brussels sprouts proved to be a bit too large a portion for Dan or I to finish so you will probably have leftovers if you are just serving two. 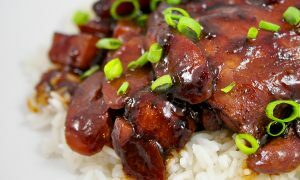 The chipotle honey sauce is sticky and spicy and savory and sweet at the same time. I made a bunch more of it and am putting it on everything right now. I did think that if you had more time or foresight that this dish would be a little more flavorful if you let the chicken marinate in the sauce for a few hours before roasting it. If you douse the chicken in the sauce in the morning and leave it in the fridge all day you might get a little more of the sauce flavor in the chicken itself. If I make it again I may also pound the chicken a little flatter to ensure totally even cooking and a bit more sauce coverage. That would also cut the roasting time to 20 minutes even and make dry chicken an even less likely outcome. 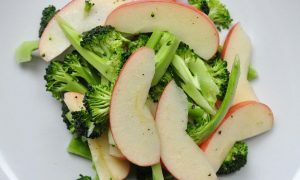 But even without those tweaks this is a satisfying, flavorful and healthy meal that you can easily make on a busy weeknight. 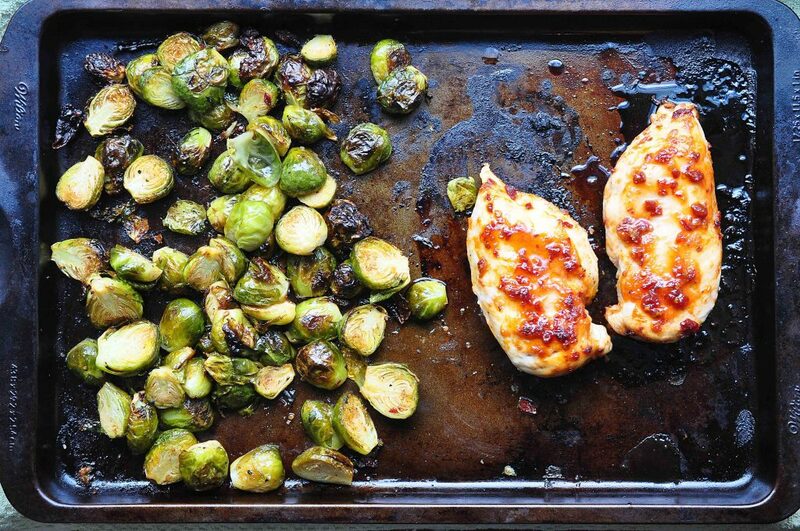 Chipotle Honey sauce drizzled chicken breasts roasted on one sheetpan with brussels sprouts. A very quick and simple weeknight meal that results in moist chicken and crispy brussels sprouts. Set the oven to 450 F.
While the oven warms, slice the stem ends of the brussels sprouts off and then cut them in half. 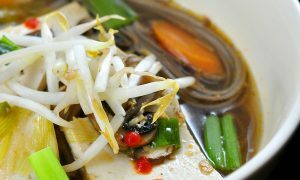 Toss the halved sprouts into a bowl. Make the sauce by mixing together the chipotles themselves (make sure they are as finely chopped as you can make them), the adobo sauce (this is the sauce the chipotles come in and we want both the sauce and the peppers), honey, garlic, melted butter and salt. Stir it up and give it a taste. If you want to add more salt, honey or chipotle go right ahead. Cut the chicken breasts in half if you have a smaller appetite or are doing some portion control, otherwise, sprinkle salt and pepper all over the chicken breasts, then slather the outside of the breasts with about half the sauce, saving the rest. Rub the sauce all over and place the chicken breasts on one half of the sheet pan. Melt the remaining butter and pour the melted butter over the brussels sprouts. Generously season with salt and pepper. Drizzle about a tablespoon of the chipotle honey sauce all over the brussels and and finally mix it all together with your hands or a spoon. You should still have some sauce left over for when the chicken comes out of the oven. Tumble the brussels sprouts onto the other side of the sheet pan and spread out into an even layer. Roast for 20 to 25 minutes, until the chicken is cooked through and the brussels sprouts are tender and some of the outside leaves have blackened. While cooking you might get a bit of smoke as the honey burns on the edges of the sheet pan, but don't worry, it is just getting roasty and delicious. To be 100% your chicken is cooked through you can use a meat thermometer. Stab the thermometer into the center of the thickest part of the meat and if it registers 165F you're good! You can also cut into the meat to make sure, but 25 minutes at that heat should be good enough, and to avoid dry meat it's best to let the chicken rest a bit before cutting into it so you don't lose the juices. 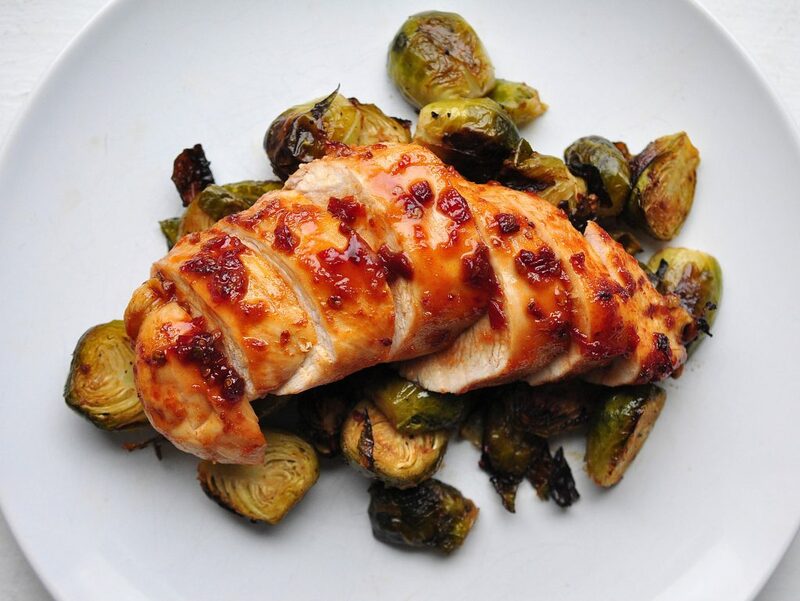 After you have pulled the pan out of the oven and let the chicken rest for a few minutes, serve it up by piling plates high with brussels sprouts, then slice the chicken into a few pieces and lay it on top of the brussels sprouts pile. 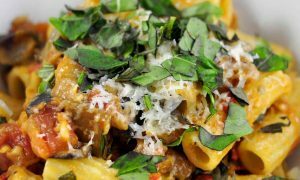 Drizzle the remaining sauce over the top and enjoy! If you are worried about cooking the breasts through (as I often am) another way to have the breasts cook evenly is if they are both slightly different sizes, pound them both lightly to get them a little thinner and even thickness. That way they will be done at the same time. Sounds Delicious. I would line the pan with foil for easy clean up! Can’t wait to try this Recipe!